Welcome to our website and our young learners' page. Here at ITS, we believe that learning should be both fun and effective, and we look forward to seeing your kids soon! We currently offer our tutorial for young learners one-on-one, taught by one of ITS' language experts. Contact us by email or at 2116 3916 (Central MAP) or 2116 3258 (Tsim Sha Tsui MAP). Find a booking form here. 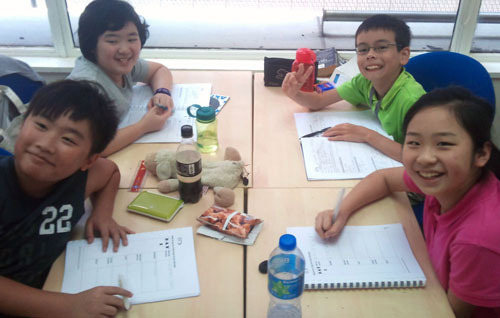 ITS offers the same high-quality, holistic group classes described below to primary and secondary schools in Hong Kong. These classes lead to certificates in the Cambridge YLE or Pearson PTE YL exams. Please contact us by email or at 2116 3916 for more information on curriculum, pricing and scheduling. Q: Which level should my child join? PTE- “The test is most suitable for children around the ages of 8 to 13.”. Q: What’s next after my child finishes a young learners program? A: Both the PTE and Cambridge suite of exams extend beyond young learners. The Cambridge KET (Key English Test) and PET (Preliminary English Test) are the next levels and popular options for students who have finished a young learners program but are still too young for higher-level exams and classes. ITS Young Learners offers both a KET and PET course tailored to the needs of younger learners of these programs. Find a booking form here. Andrew has a degree in English language and literature from the University of Delaware, and has been teaching young learners in Hong Kong for over ten years. He also the director of curriculum development for ITS, and has developed a variety of useful and engaging learning programmes for young learners and teenagers.